Big shoutout to Joel (a.k.a. Mr.JustRight1) on his new RDA, the Wotofo Profile. He specifically designed this one to remedy the biggest issue with mesh rebuildables: cotton collapse. The deck utilizes a spring-loaded ceramic support to keep the cotton tight against the coil and eliminate the likelihood of dry hits. I definitely have to applaud the innovation there! If you want to check it out, just head over to VaporDNA. 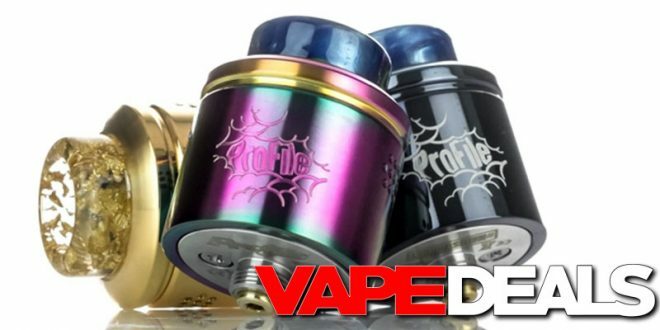 They’re currently selling the Wotofo Profile RDA for only $22.49 when you apply coupon code “deals10” at checkout. There are 6 different colorways to choose from: black, blue, gold, gunmetal, rainbow, and stainless steel. This low price isn’t guaranteed to last, so stop by soon if you’re interested.